The Pearl EXX725 Export is a reintroduction of the most successful drumset in history. The EXX725 Rock Drum Kit includes a snare and bass drum two rack toms and a single floor tom in addition to a 830 series hardware set. 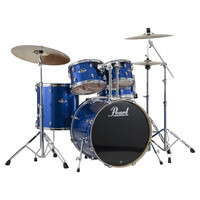 Finished in a Blue Sparkle colour the EXX725 also includes a Sabian SBR cymbal box set. Sabian SBR cymbals feature a hammered and lathed surface with tightly focused sounds of pure brass.